I’m not sure if there is a food group better suited for celebrating than sprinkles. Yes, I just categorized sprinkles as their own food group and I won’t take it back. Honestly, you can’t help but just adore sprinkles. Sprinkles are definitely all we need when it comes to celebrating a certain blogging friend of ours who just-so-happens to be tying the knot soon. You might know her – Sally of Sally’s Baking Addiction? If you do know her, then you know she shares my love for sprinkles and for cookies. And that is what today is all about – Sally & sprinkles. Cheers to you, Sally and many years of marital bliss, and tons of confetti cookies to go along with it! And maybe a confetti cookie milkshake or two, also! 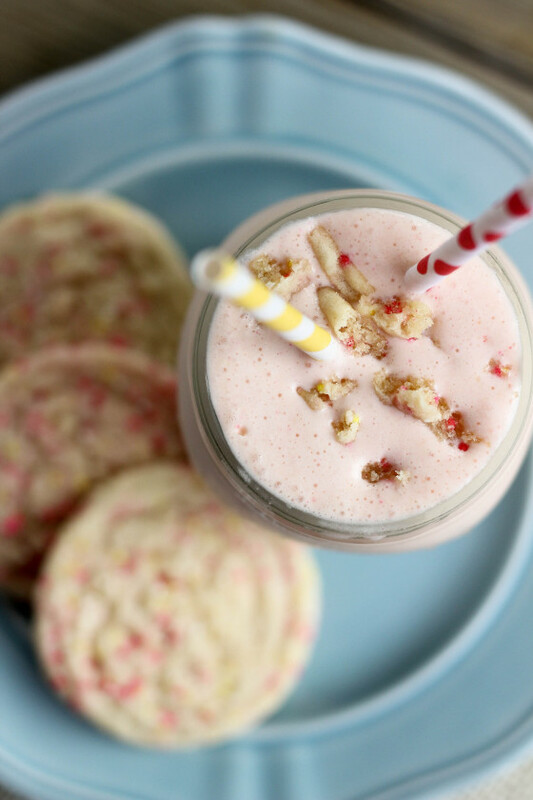 What I made for Sally is a super simple three-ingredient milkshake using confetti cookies. The cookies are soft sugar cookies mixed in with vanilla ice cream and milk, and blended until smooth, and then served with a little extra cookie crumbled on top. 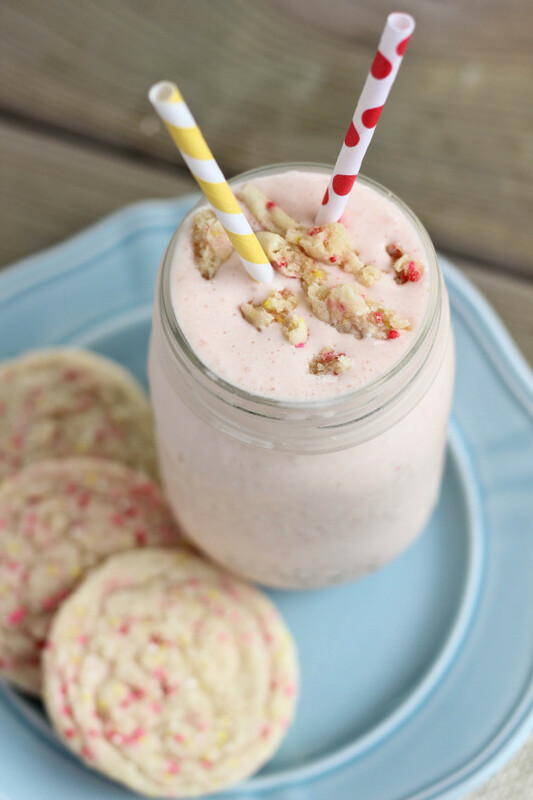 A super simple, and colorful, milkshake using soft confetti cookies. Divide evenly among two glasses and garnish with additional cookies or sprinkles on top, if desired. 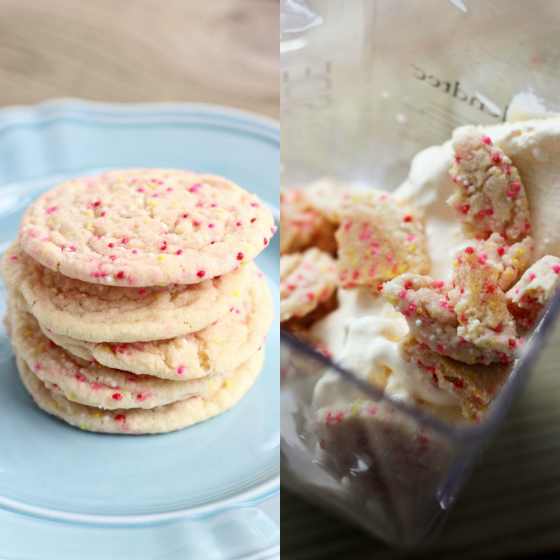 If you need a good confetti cookie recipe, check out these links, they are my go-to for a sprinkle cookie fix! Cassie! 🙂 I could drink this all day, everyday. You certainly know what I like best and I love that we share a mutual love for oatmeal cookies and butterscotch, too. Thank you from the bottom of my heart for this incredibly sweet post and recipe. And the virtual shower is the biggest surprise! I am so lucky to have so many supportive, wonderful, encouraging, and loving blogging buddies. Thank you so, so much! I would looooove to sip on this! What a fantastic way to eat my cookies and my sprinkles!! That looks SOOOO good!!! Ooo! I wish I could have a tall glass of this milkshake right now! Love it! This is like a celebration on the go! I would totally fill up my to go mugs with this and drink it on my way to work, on my way home from work, while I’m out running errand 🙂 This sounds super amazing, and I love the fact that it’s for Sally’s bridal shower. She’s one of my favorite food bloggers, and I’ve been enjoying all the delicious treats that her friends have thought up! 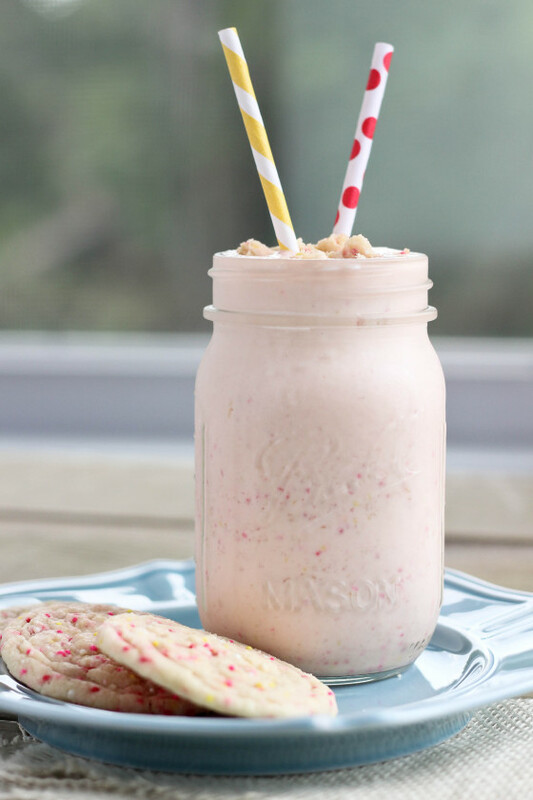 Sprinkle-smothered cookies INSIDE of a milkshake?! Hubba, hubba! I want to give myself a facial with this. this looks amazing!! LOVE a good milkshake! yum! Brilliant!! And cheers to Sally!!! I seriously need one of these milkshakes right now. Anything confetti is the best! Such a fun milkshake! Sprinkles are the best way to celebrate! This is adorable! and happy bridal shower to Sally! Awww!!! SO FUN! Congrats to Sally and yum to this milkshake! You’re right…sprinkles make all things in life more joyous. This is the perfect drink to celebrate Sally! SO yummy! Hey, I like this, three ingredients, perfect! This is totally making me want to get some confetti cookies soon! What a fun milkshake! And congrats to Sally! I want one for each hand. Holy yum! This might be the happiest, girliest milkshake ever. I love it!